A repentant creative director would love to make more RPGs like Dark Souls - if the fans will forgive him. It's easy to forget that game developers, in spite of their impressive creative abilities, are normal folks like you and me. They laugh, they cry, and they often find it hard to admit when they've made a mistake. Hidetaka Miyazaki, the creative director behind the ultra-challenging RPG Dark Souls, however, does not seem to have that problem. Miyazaki, while very proud of his team's creation, acknowledges that the game had its share of crippling technical issues and asks forgiveness for them. While he would like to make another installment in the series, he wants to make sure he has goodwill from his fans first. Miyazaki makes no apologies for the game's relentless difficulty or the sometimes-cheap tactics necessary to get past the games challenges. The game's frame-rate issues, are a different story. "[There] were technical difficulties," says Miyazaki. "I don't believe that it's okay to have them, but realistically speaking, it was quite a large-scale game - even in terms of budget and expectations. So we're very sorry for the trouble we've caused." In spite of his disappointment with these aspects of Dark Souls, he believes the game's ambitious world and mechanics made perfection all but impossible. "[There] were areas where we felt our technical side couldn't keep up with the game's scope, like an increasingly growing ache." When asked about a potential sequel, Miyazaki remains ambivalent. "We don't even know if we'll have another chance," he admits. "We have the confidence that we can improve from our mistakes this time and create an even better Dark world, but we don't know if the users will forgive us for the mistakes, so I cannot give an exact answer." Technical difficulties aside, many fans and critics alike viewed Dark Souls as a high-quality product and worthwhile experience. 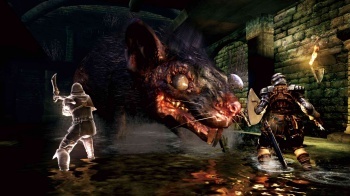 That multitude of gamers who had frustrating fun with Dark Souls can probably find it in their hearts to forgive Miyazaki - provided, of course, they can stop cursing his name as they dive off castles to evade dragons.